Going “Home” (?) – Are We Where Yet?!! 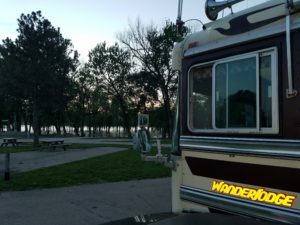 Nearly finished with our first crack at “full-time” RVing — heading back to Chicago. We stopped a couple of times; Once in Baraboo Wisconsin (Ho-Chunk Casino parking lot) and also Delavan’s Walmart. 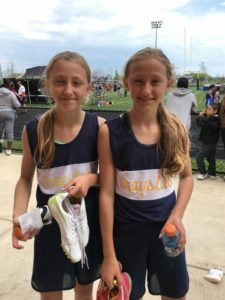 Then we decided to add a stop in East Peoria, IL: Liz’s nieces, Grace and Caroline Kokkin were running in the Division II Illinois State Track meet for middle-school. We arrived a day before the Track meet, and pulled into the back corner of the parking lot. We had thoughts about staying there…who would care if we parked way in the back of a huge lot. We asked permission…even offered to pay for the three spots we were taking up. In retrospect, we should have asked for forgiveness rather than permission…we were told “ABSOLUTELY NOT” as that lot would be completely full and a total mad-house during the meet (and, it was!). 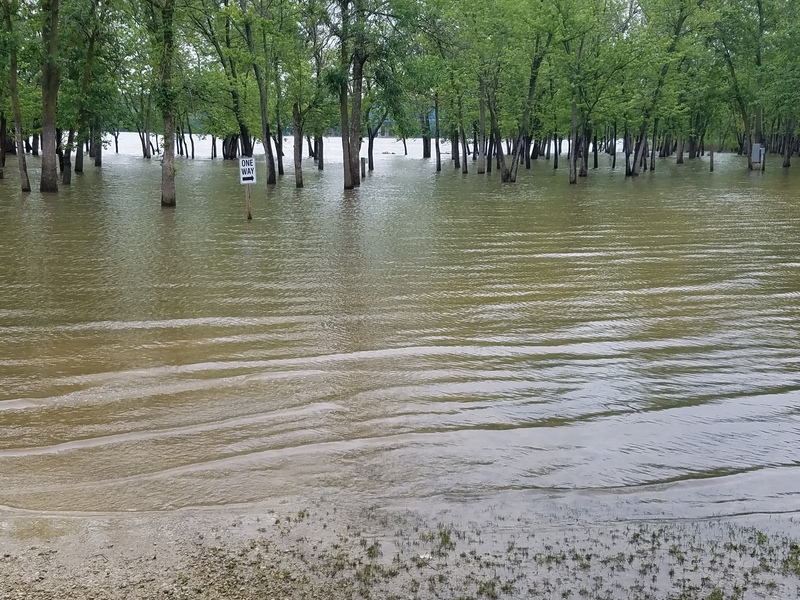 So, we stayed overnight at a County Park right on the Illinois River. This park is a very nice place, though still half under water from spring flooding. 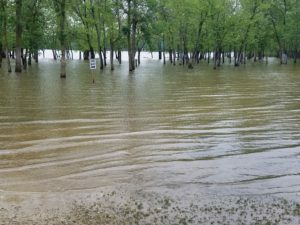 Fortunately, water receding. The track meet was a hoot. We met up with Liz’s sister and nieces, and sat around for a while until their event. Then found a place in the stands to watch. MORE INSPIRATIONAL Nieces. The kids did GREAT. Grace ran the 1,600 meter in 5:30 – good for SEVENTH in the state! Caroline ran it in 5:45. Both of these were new personal bests against the best runners in the state. I suspect we can plan to attend more championship track meets in the coming years as we return to Chicago for doc appointments, dentists, etc.!! While in Peoria, we had a water line in the bus spring a leak! This was due to a pinhole in an old rubber tube. Was able to repair the tube with a replacement purchased at Lowes. But once repaired, the water pump refused to pump! This is a problem for us ONLY when we park in Walmart lots or elsewhere where there is no water hookup. So no problem in Peoria, but needs to be fixed before we hit the road again for the summer. Once again, bus repairs for less than 4-digits. We are still married. And Smiling! I wake up in the middle of the night in a strange bed in a strange room, wondering where the bathroom is. The first several times we returned from running errands, Liz and I both started to walk UPSTAIRS, where our home had been for 25+ years. That is not to say we are not happy to be in Chicago and happy to be in our newly renovated apartment, which we hardly had the chance to enjoy before leaving town in December-last. ALMOST THE FIRST THING we did was to hit the Burrito Place under the “L” train at Addison. 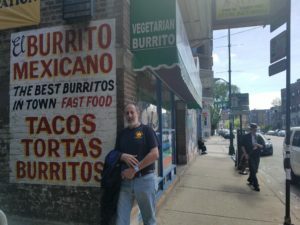 I have seriously missed these, even as we passed all across the southern border, with many Mexican Food options along the way. Though some were really good, none were “Soul Food” the way our friends at BAM make them! And, Sunday morning we went to brekkie at our “usual” place: The Korean Place near Wrigley that serves American Breakfasts on weekends, along with Korean Delicacies like Kim Chee, Bul Gol Gi, Bi Bim Bop, etc. At BOTH PLACES, the folks remembered our orders exactly! I guess we are “HOME” after all! It was great to see and talk to our neighbors again. Next door neighbor Jason remarked that we cannot sneak up on anyone in the bus! His kids were all bigger, all remembered us, waved from their front window and all wanted to honk the horn!! Across-the-street Nancy Sinclair stopped by as we were unloading and we chatted for a bit. Nancy and Sid were the neighbors that by complete coincidence were in Sedona, Arizona at the same time as we were…tho we did not connect there. It turns out that both of our tenants’ names are “MIKE.” you have no idea how welcome that is for a memory-challenged old fart landlord! 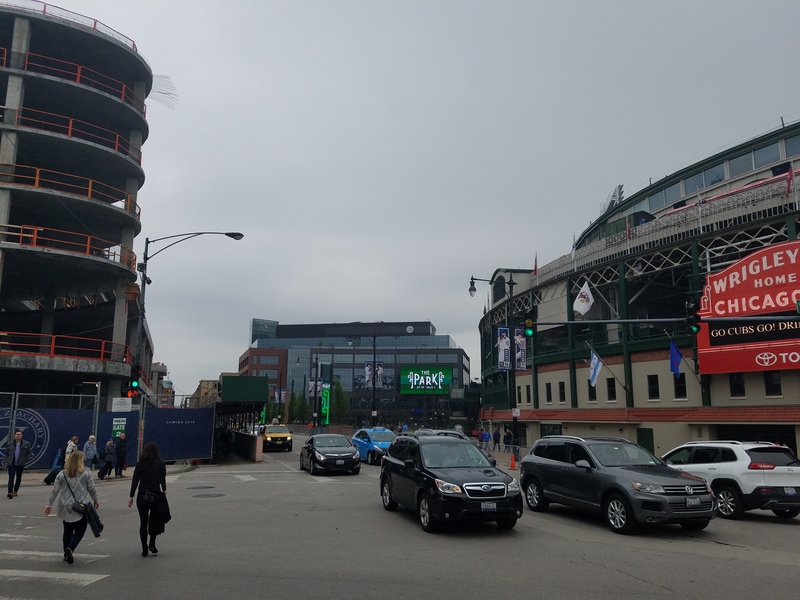 It also turns out that top-floor-Mike is the Director of Pub Operations for Goose island…a strategic rental for sure!!! After unloading, we relocated the bus to a storage facility…Liz suggested we call boat-yards where the boats are leaving for a summer in the water. One of these, on South Ashland in Chicago was happy to find a place for the bus for a few weeks. Covered storage, with power. So I can FIX THE WATER PUMP. 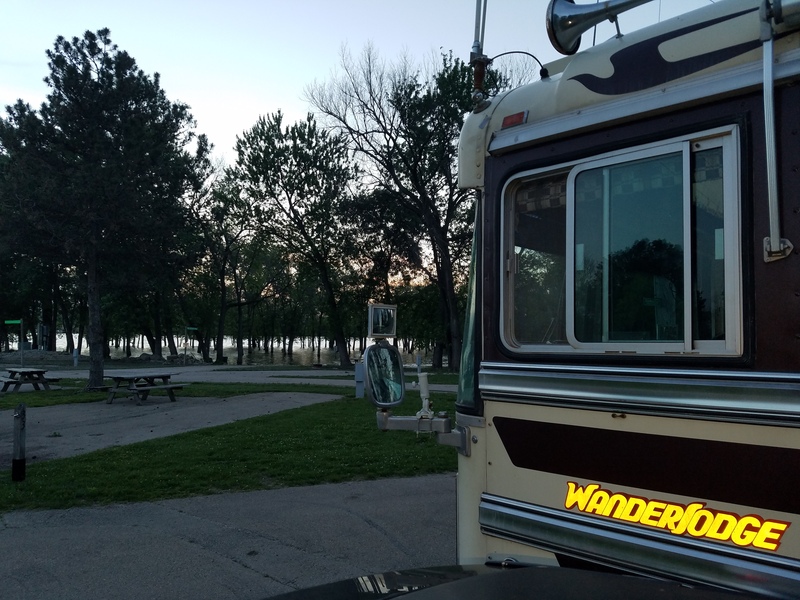 We will be hitting the road again in Mid-June…most likely the blog will be more or less dark until then! Welcome back. I won’t say welcome home based upon your blog. We also are back in Northbrook our what we now refer to as our summer home. It is great to have you back for a while at least. We would love to see you in the dance class while you are in town. Welcome home. The country roads are now safe since you are here? Really enjoyed all your blogs. Liz must be a saint. Welcome “home”! A chance to get your own parts and pieces tuned up before you hit the road again. Much love to both of you. ← Last “scheduled” stop on the first circuit – Minneapolis ← Chicago for month…and we survived! Chicago for month...and we survived!